Facebook Trending is a feature of the social network designed to show each user a list of topics that are spiking in popularity in updates, posts, and comments. Facebook Trending appears as a short list of keywords and phrases in a small module at the top right of the user's News Feed. In addition to Top Trends, you can choose trending topics in politics, science and technology, sports, and entertainment. The Trending module shows a keyword, hashtag or phrase that has spiked in popularity on Facebook. Clicking on the headline or keyword leads to a special page with a full news feed of other posts on that particular topic. This includes content published by your friends, commercial and celebrity Pages, even by strangers who have made their status updates public. Facebook typically shows only three trending topics to the right of your news feed, but clicking on the small "more" link at the bottom leads to a long list of 10 trending topics. While Facebook aims for personalization, the reality is that you will often see items of general interest, including popular entertainment figures, sports, and politics in the top ten trending items. Can You Remove or Customize the Facebook Trending Module? You can't remove the Facebook Trending module, though you can customize what you see to some extent. If you are tired of seeing items about a particular celebrity when that name is trending hover over the item and look for the X to the right of it. 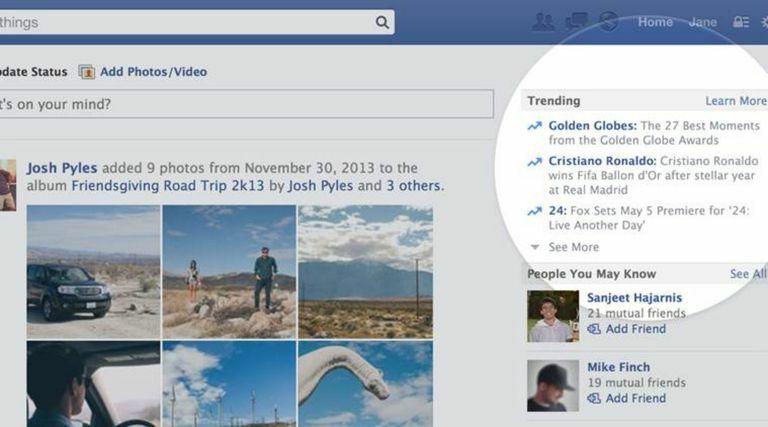 This enables you to hide that item and Facebook promises not to show you that topic again. You can check reasons including that you don't care about it, you keep seeing it, it's offensive or inappropriate, or that you want to see something else. Unfortunately, Facebook doesn't allow you to choose to see the headlines from the more-specific Trending modules rather than the Top Trends without clicking on those modules. If you don't want to see a particular topic in the Top Trends, you need to curate the feed to hide it. Like Twitter's trending list of hashtags, Facebook Trending topics are supposed to reflect real-time interests, showing what's spiking in popularity at any given moment. It is a key part of the company's plan to offer a personalized newspaper and virtual water cooler for conversations about current events, not just people's personal lives. Greater relevance to special-interest news topics obviously can help Facebook build and grow a significant advertising business since marketers like to target ads by topic and interest. Originally, the Facebook Trending section had a short descriptive text to set it apart from Twitter's well-known trending topics list based on hashtags. Twitter hashtags are typically one or two words, or a few mashed together. However, Facebook adopted a similar short link without descriptive text in 2016. A more important difference, perhaps, is personalization. Facebook's Trending section is personalized to each user, based not only on what's hot all across Facebook but is based on your location, Pages you've liked, timelines and engagement. It's designed to reflect each user's personal interests. Twitter trending lists, by contrast, are based on what the entire Twittersphere is talking about. Though it does allow users to select different geographic regions, Twitter's version isn't governed by a personalization algorithm that analyzes each user's followers or activities on the network; it's standardized for everyone. Facebook is trying to be more personal, perhaps because it has little choice. Facebook can't effectively provide a clickable list of what's trending all across its network and show the actual comments on a particular topic, since most of the content people post is private, with viewing restricted to friends. That's a huge difference with Twitter, where most people make their tweets publicly visible. Twitter is designed to be more of a public communication network, though Facebook has steadily been moving in the direction of public communication by mimicking many of Twitter's features.